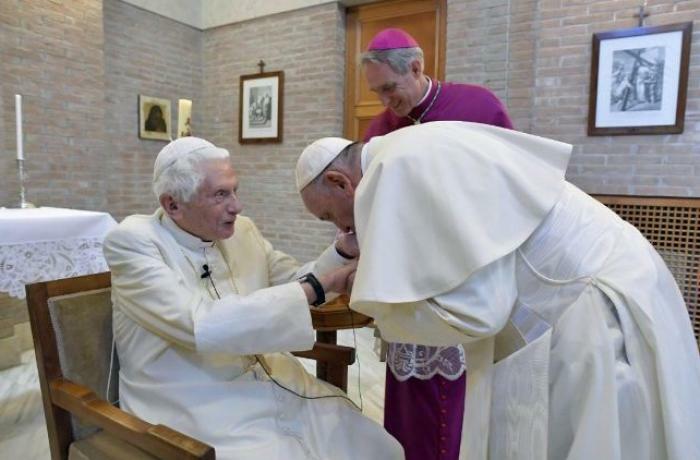 Vatican City (AsiaNews) – Benedict XVI published a long essay in the German monthly Klerusblatt and the Italian daily Corriere della Sera, an English version has been made available by the Catholic Herald (see below). The article deals with the paedophilia scandals that have affected the Church and led many believers to leave the Church community. In it, the Pope Emeritus writes, among other things, that “Only where faith no longer determines the actions of man are such offenses possible.” He goes on to note that paedophilia was eventually “diagnosed as allowed and appropriate” starting with the "Revolution of 1968," which "sought to fight for [. . .] all-out sexual freedom”. At this time, "Catholic moral theology suffered a collapse” within the Church, which led to situational morality, in which there are no more good or bad actions, nor values whose defence is worth risking one’s life. Thus, martyrdom as “a basic category of Christian existence” was no longer "morally necessary". Later people began thinking that the Church had nothing to say about morality, only about faith. However, "Those who deny the Church a final teaching competence in this area force her to remain silent precisely where the boundary between truth and lies is at stake." Thus, the specific contribution of Christianity to human life is destroyed. "The image of God and morality belong together and thus result in the particular change of the Christian attitude towards the world and human life." As an example, Benedict XVI cites a bishop in the United States who showed pornographic films in the seminary, the presence of homosexual clubs in schools, the education of young Germans training for the priesthood whilst living with "their girlfriends" in the seminary. Attempts by Pope John Paul II and Benedict XVI himself to fix these mismatches met with great resistance. Even the books by Joseph Ratzinger were banned in many seminars because they were "unsuitable for the priesthood" and "bad literature". The pope emeritus also noted limits in canon law, which protects too much those accused of paedophilia and does very little to protect the faith as an important asset. Faced with such crimes some abandon the Church, whilst others thought about creating “another Church for things to work out". All this, however, is pointless unless we understand that paedophilia spread in the Church and the world because of the "absence of God". The second point is the revival of the Eucharist as a living presence of Christ and his death and resurrection, not reducing it to a mere "ceremonial gesture", given out to anyone for proper education. Finally, the Pope Emeritus’s essay turns to how to counter the disaffection towards the Church, now considered only as a political entity, a situation that leads the Church to die "in souls". For Ratzinger, the "disparagement of creation" because of the horrible events that took place is a "disparagement of God". And "the accusation against God is, above all, about characterizing His Church as entirely bad, and thus dissuading us from it." The Church, he notes, has always been a net that has caught good fish and bad fish, a field where good grain and weeds mingled. “The idea of a better Church, created by ourselves, is in fact a proposal of the devil, with which he wants to lead us away from the living God, through a deceitful logic by which we are too easily duped. No, even today the Church is not just made up of bad fish and weeds. The Church of God also exists today, and today it is the very instrument through which God saves us. 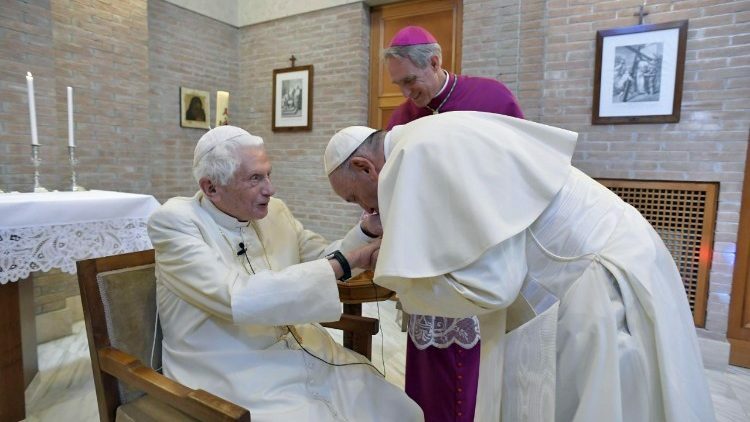 In his introduction, Benedict XVI stresses that the essay was published after he "contacted the Secretary of State, Cardinal [Pietro] Parolin and the Holy Father [Pope Francis] himself," to whom he expresses gratitude several times. Pope: Christ's Christmas and 2005 "which is about to set"